It’s easy to see why it’s the ADA’s most popular brochure. 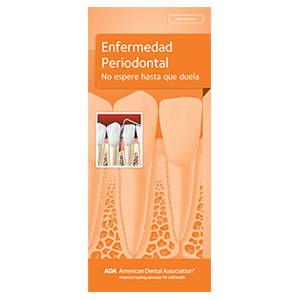 This comprehensive brochure uses up-to-date images and plain language to review every aspect of perio – from prevention to treatment – making it effective and impactful to a huge portion of your patients. With crystal clear illustrations of probing, SRP, and periodontal surgery, along with bone loss x-rays and “stages of perio” photos. Emphasizes above all else that early treatment is key to preventing tooth loss. Spanish version, 12-page booklet, pack of 50.